The ECSS Multipactor Tool (Copyright ESA/ESTEC) is a software tool based on the European Cooperation for Space Cooperation (ECSS) following document: Multipaction design and test, ECSS-E-20-01A, 5th May 2003. The software includes the single and multi-carrier cases providing repective margins according to the description in such a document. This software is not a Multipactor Simulation Tool. 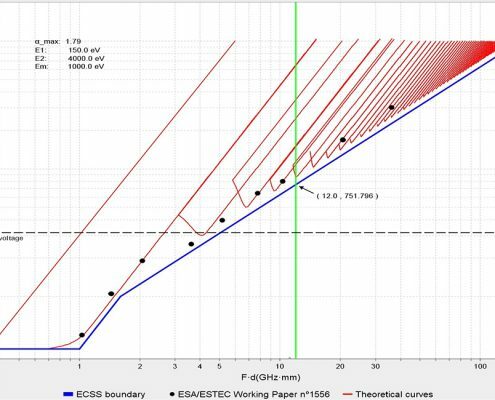 It does not simulate the breakdown power of a particular structure or material; the software takes the ESTEC Multipactor pre-calculated susceptibility charts for the five materials defined (Alodine, Silver, Gold, Copper and Aluminium) and computes breakdown levels according to them. The breakdown levels are given in Watts by performing a conversion from Voltage to Power. This conversion is done for three cases: when this relationship is known (rectangular waveguide or perfectly matched gap) or when the user has computed numerically the voltage at 1 W input power in a particular component region by means of an external Electromagnetic Software Tool (general case). Interestingly, the ECSS Multipactor Tool includes an optimizer for the determination of the optimized phases for the multicarrier case. The user can choose to optimize the phases for any number of electron crossings. In addition to this, the software includes some particular tools that could be of interest for the user, such as a skin depth calculator, an electron growth tool, a tool to evaluate the penetration of electrons in metals, etc. No part of ECSS MULTIPACTOR TOOL may be copied or reproduced, in whole or in part, in any manner or form on any media, or sold, licensed, distributed or transferred to any person, or used, or adapted, without prior written permission of the European Space Agency. The European Space Agency and Val Space Consortium hereby disclaim any liability for use of ECSS MULTIPACTOR TOOL and assume no responsibility for any error or omission therein. If you want to download ECSS MULTIPACTOR TOOL, please fill-up this form. A confirmation e-mail will be sent to you after the revision of your request.